Demolition plans for Selmo Park at the University of Central Missouri began today following the UCM Board of Governor’s approval of a $30,000 contract with Red Rock Construction in February. Work began on the site today and is expected to be finished by April 30, according to an email from Jeff Murphy, assistant director of media relations at UCM. The decision to begin this week coincides with UCM’s 2015 spring break. 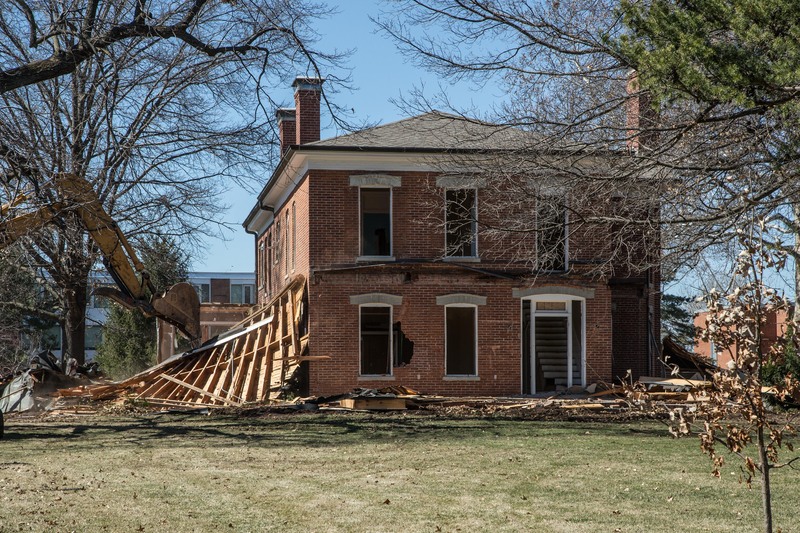 The decision to demolish Selmo Park, which has been home to the University’s president Chuck Ambrose, was made following a Board of Governor’s decision to not move forward with a projected $2 million in repairs to the structure. The property assessment was conducted in cooperation with Burns & McDonnell Engineering based in Kansas City. According to Murphy, despite the long history of Selmo Park at UCM, the Board of Governors emphasized the university’s priority is to provide the highest quality education it can for its students at the most affordable cost. At a time when state of Missouri’s support is declining, Board members indicated spending $2 million on Selmo Park renovations was not deemed in the university’s best interest in serving students. The Board recommended and approved removing the house from the property, and in its place providing a green area, until the university determines another use. UCM’s Board of Governors in September 2014 formed the Selmo Park Committee to assess cultural and historical values of Selmo Park property, including the grounds, outbuildings, and the main structure, and to identify particular aspects of Selmo Park property for inclusion in the University Archives, repurposing in other UCM properties, and public exhibition. Their final report was presented to the board in February, 2015.